As we begin another work week... Who in the world is ready?? Hello!!!?? Anyone out there prepared and psyched, bright eyed and bushy-tailed? I know I am not!! But listen to what is making me happy. I have this Facebook group that I may have mentioned, "Leonard Pennario, America's Greatest Pianist." I started it as a lark maybe a month ago and now we are up to almost 100 members globally, even with me being half asleep at the switch and doing next to nothing to promote it. When I started my group I typed in, "This is for people who love classical piano and wish to celebrate the greatness of Leonard Pennario ..."
A few weeks ago I went back and edited it and wrote: "This is for people who love classical piano and wish to celebrate the supremacy of Leonard Pennario ..."
Somewhere the old man is loving that. Well, it is true! Yesterday I got a communique from a pianist in Belgium. That is a word I plan to use more often, communique. His name is Marc Bauwens. That is a picture of Mr. Bauwens up above. He graduated from the Royal Conservatory of Music in Brussels. He looks brilliant and intense! Which he must be, seeing that he plays Messiaen. I do not play that, I will tell you that right now. 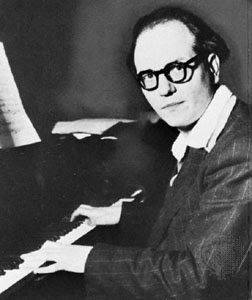 Here is a picture of Messiaen at the piano crafting one of his thorny, uncompromising, orthodox Roman Catholic creations. Pennario loved Messiaen and had a million CDs of his music and had a funny story about when he met him. You have to love anyone who has a funny story about Messiaen. Leave it to Leonard! Here is a bit of Messiaen played by Ilya Itin, one of our new friend Marc Bauwens' teachers. Marc Bauwens sent me a little note. He wrote: "I have been an admirer of Leonard Pennario for the past 30 years, mainly through his Rachmaninoff recordings. When I heard his interpretation of the Rachmaninoff first concerto with André Previn, I immediately decided to learn this work myself, I had just finished the Conservatory at that time..."
Which really warmed my heart. Isn't that great, that Pennario's performance influenced this pianist to learn this concerto? I am so proud of Pennario. Look at how he makes Buffalo look in the eyes of the musical world. Here we spend so much time sitting around kvetching about we lost four Super Bowls, blah blah blah. And here is this pianist in Belgium, we are over the top in his mind because we produced Leonard Pennario, America's greatest pianist. Thinking of Brussels and Buffalo begs a question. I wonder if Brussels is as proud of Brussels sprouts as we are of chicken wings. They should be! I love Brussels sprouts. I have a bunch of them in the vegetable crisper right now as we speak. 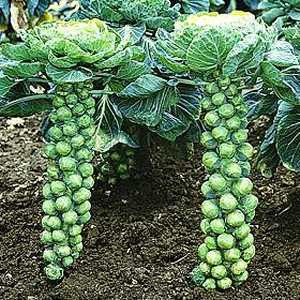 I wonder if Brussels has a Brussels Sprouts Festival. Hmmm. I think they do not. I did research and found that the only Brussels sprout festival the world over is in a place called Rogersville, New Brunswick. Trappist monks brought Brussels sprouts there relatively recently, in 1905. I cannot believe Brussels dropped the ball on this. They should have a Brussels sprouts festival. They could crown a Miss Brussels Sprout and power eaters from the world over converge and see how many Brussels sprouts they can eat in five minutes. They could have a Brussels sprouts sauce contest. We could let them borrow Drew Cerza and Donn Esmonde for a couple of weeks to help hype the festival. Here is another thing. My friend Art, who made the Blood and Sand cocktails I talked about yesterday, he once found a guy named Russell Sprouts. The Brussels Sprouts Festival could welcome Russell Sprouts as their emcee! C'mon, Brussels, how about it? I have been to Brussels and it is a beautiful city and I think it cries out for a Brussels Sprouts Festival. A city that produced Leonard Pennario cannot be wrong. your comment on my husband Marc Bauwens and Brussles sprouts deserve appreciation. 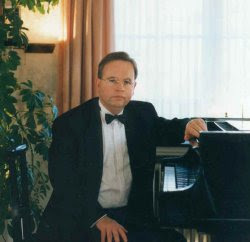 My husband is an unsung hero when it comes to piano music I have great admiration for him for the fact that he started learning piano at the age of 16 which is unusual and started teaching piano at 25. Don't look for me at the Brussels Sprouts Festival!!! Dear Lakshmy, thanks for your nice words! I was just kidding about the Brussels sprouts but still, I am happy to have learned of your husband Marc and I hope he goes on to play "Midnight on the Cliffs!"! All best to you and thank you! And David, you have obviously not had Brussels sprouts the way they deserve to be made. I roast mine with olive oil and kosher salt. Yum!